William Dawson owned conventional photographic portrait studios in Brighton, but he was primarily a beach photographer who worked from premises on Brighton's seafront. At various times, Dawson also worked in Brighton as a tobacconist, refreshment room proprietor, a manufacturer of mineral water and, at the end of his working career, a fruiterer. [ABOVE] A cabinet portrait by Dawson & Co. of Brighton which is believed to show William Dawson (1843-1920), the proprietor of the photographic studio in London Road, Brighton. 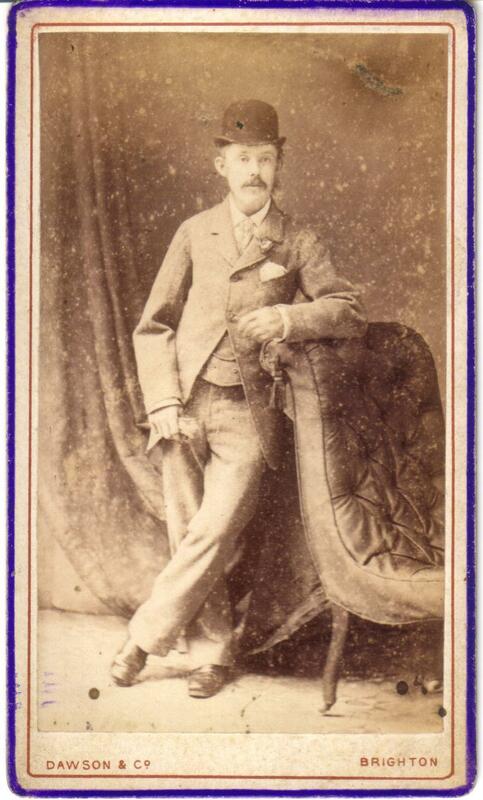 William Dawson was born on 1st July 1843 in Bury, Huntingdonshire. William was the second eldest of seven children born to Sarah Ricketts and William Dawson senior, a blacksmith. In his teens, William Dawson junior left home to enter domestic service. At the time of the 1861 census he was working as a servant in a Cambridgeshire household. Working alongside William Dawson in 1861 was a fellow servant, Ann Elmer (born 1842, Upwell, Cambridgeshire/ Norfolk). Ann probably introduced William Dawson to her older sister Susan Elmer Hunter (born 1840, Upwell, Cambridgeshire/Norfolk), who was working as a domestic servant in Surrey at the time of the 1861 census. Susan Elmer Hunter was born in the village of Upwell ( a fenland village on the border between Cambridgeshire and Norfolk) on 3rd June 1840 to a single woman named Ann Hunter. Susan Hunter was baptised on 28th June 1840, around the time her mother Ann Hunter married William Elmer. [Marriage of William Elmer and Ann Hunter was registered in the district of Wisbech during the 2nd Quarter of 1840]. When William Dawson married Susan Elmer Hunter at St. Mary's Church in Marylebone, London, on 12th August 1863, he gave his occupation as "Coachman". At the time of their marriage, William Dawson had just turned twenty and Susan, his bride, was twenty-three and expecting a baby. The couple's first child, a daughter named Priscilla, was born in Marylebone, London on 9th January 1864. A son called Fred was born in London in 1866 [ birth registered in the London district of Marylebone during the Second Quarter of 1866]. In the late 1860s, the Dawson family left London and travelled south. In the Summer of 1868, the Dawsons were in Shipbourne, Kent where William and Susan's third child, Alice, was born. By 1870, William Dawson and his family had arrived in Brighton and William's fourth child, Laura Clara Dawson was born in this seaside town during the Second Quarter of that year. By the early 1870s, William Dawson was working as an itinerant photographer, travelling around the seaside resorts on England's south coast. At the time of the 1871 Census, William Dawson was earning a living as a photographer in Littlehampton and boarding at temporary lodgings. By 1872, William Dawson had returned to his family in Brighton, where a fifth child, Arthur, was born. 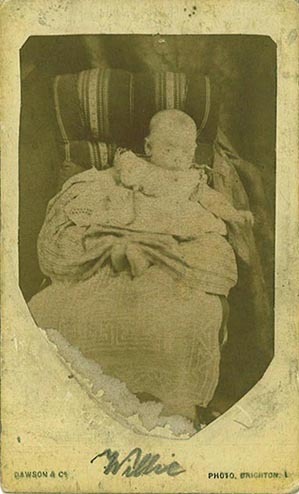 William Dawson's sixth child, a son named William Henry (known as Henry), was born in Brighton around 1874. The next addition to the family was Susan Helen Dawson, who was born in Brighton in 1876. Ada Florence Dawson (born 1877, Brighton ) and Charles Dawson (born 1879, Brighton) completed the family. For a number of years, William Dawson and his family lived or worked in Campbell Road, near Preston Circus in Brighton. Initially, William Dawson worked from 1 Campbell Road, Brighton, but from about 1874, under the business name of "Dawson & Co.", he operated from premises at 106 London Road, Brighton. The firm of Dawson & Co. was still producing studio portraits at 106 London Road when Page's Directory of Brighton was published in 1882. For about forty years, from around 1872 until about 1912, William Dawson operated as a photographer on Brighton's seafront. Dawson combined his photography business with various other commercial ventures on Brighton's lower esplanade. Over a period of nearly fifty years, Dawson earned his living on Brighton's seafront as a photographer and the proprietor of a restaurant and refreshment rooms in the King's Road Arches. [ABOVE] A portrait of a young woman sitting on a beach, holding a book - a carte-de-visite photograph by William Dawson of No. 6 Arch, West Pier, Brighton. (c1872) [ABOVE] The trade plate of William Dawson, Photographer, of 1 Campbell Road, New England Road, Brighton and No. 6 Arch, West Pier, Brighton as shown on the reverse of the cdv on the left (c1872). 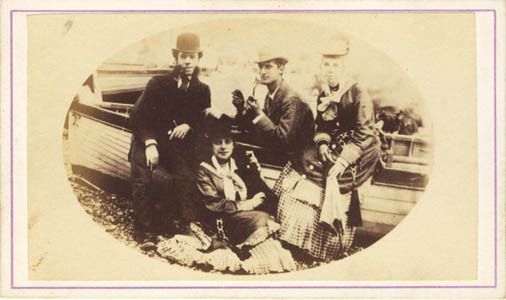 [ABOVE] A group portrait of two couples posing in front of a rowing boat on Brighton beach photographed by Dawson & Co. of No. 6 Arch, West Pier, Brighton. (c1874). 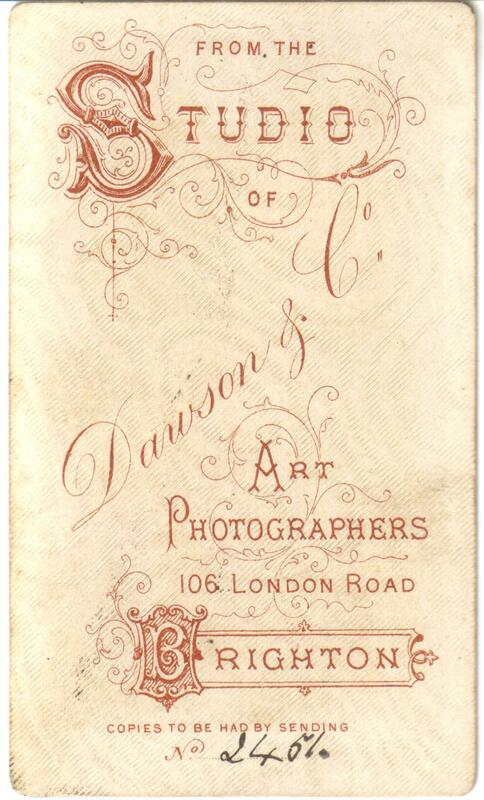 [ABOVE] The trade plate of Dawson & Co., Photographers, of 106 London Road and at No. 6 Arch, West Pier, Brighton (c1874). William Dawson was probably the first photographer to work from the King's Road Arches on Brighton beach. Dawson later established a beach photography business in the King's Road Arches near the West Pier steps. The number of the arch that housed Dawson's studio and darkroom changed over the years, being No. 27 in the early 1890s, re-numbered 65 & 66 by 1894 and finally altered to 67, 68 & 69 King's Road Arches early in the 20th century. William Dawson was one of the first photographers to set up a photographic studio on Brighton Beach. 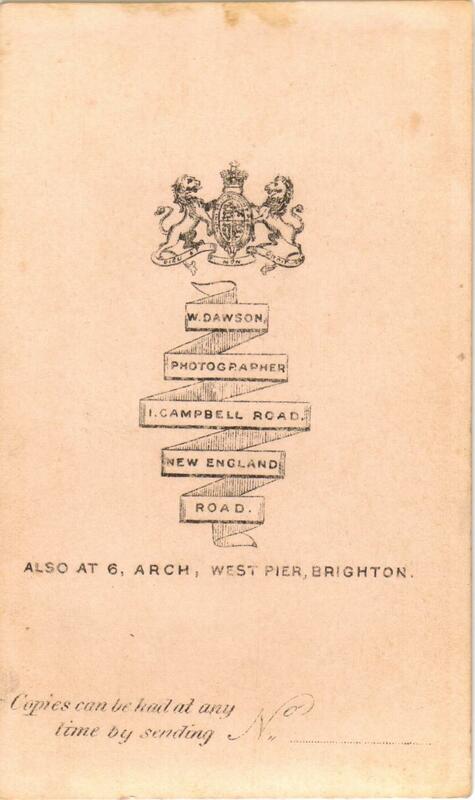 Even when he was operating a studio at 1 Campbell Road between 1872 and 1873, William Dawson worked as a beach photographer from Arch No.6 near Brighton's West Pier. In a Brighton directory for the year 1874, William Dawson is listed as a photographer with a studio address of "The Beach". Dawson worked as a photographer on Brighton's seafront from about 1872 to around 1912. In early listings, the address of William Dawson, photographer, is simply given as The Beach, King's Road, Brighton, but by the early 1890s he is shown based in the King's Road Arches. At the time of the 1881 Census, the Dawson family were divided. William Dawson, recorded in the census return as a 37 year old photographer, is shown living with his three eldest sons - Fred, aged 14, nine year old Arthur, and (William) Henry, aged 7 - at 15 Campbell Road in the Preston district of Brighton. William Dawson's five daughters - Priscilla, who was seventeen, Alice, aged 12, Laura Clara,10, Susan Helen, 5, and three year old Ada Flora - were living at 1 Richmond Road Terrace, Brighton with their mother Susan Dawson, who was nursing her youngest child, baby Charles. Susan Dawson's occupation is given as "Photographer ( wife ) ". 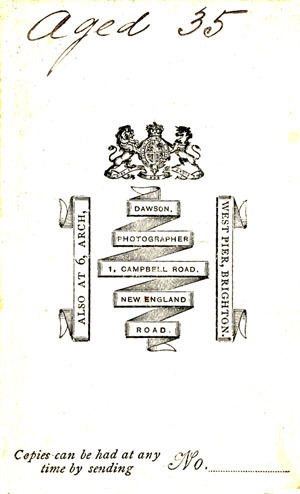 By 1884, William Dawson had relocated his central photographic portrait studio from 106 London Road to his new home at 128 Richmond Road, Brighton. Dawson retained the business premises at 106 London Road, using it as a tobacconist's shop. Around 1893, Dawson closed the studio at 128 Richmond Road. [ William Dawson's photographic studio at 128 Richmond Road is last listed under his name in 1893, when it appeared in the trades section of Page's General Directory of Brighton & Hove. Dawson's former studio at 128 Richmond Road was later used by the photographer Leonard Sarre, who was based there between 1896 and 1897 ]. After he closed his Richmond Road studio, Dawson continued to operate as a photographer on Brighton's seafront. In Kelly's Directory of 1887, William Dawson is listed as a photographer with an address of "The Beach, King's Road". In Kelly's Directory of 1890, William Dawson is shown to be working as a photographer and running a "refreshment room" near the West Pier steps. In the 1890s, William Dawson developed his seafront trade and diversified his business interests. By 1891, Dawson was running a refreshment bar and a bazaar selling fancy goods alongside his seafront "photo rooms" in the King's Road Arches. 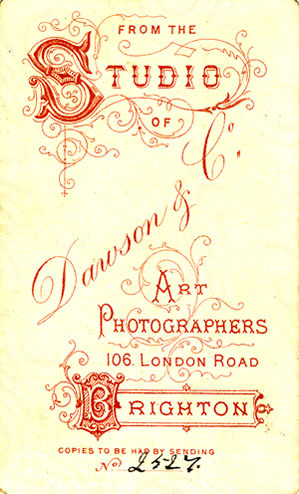 In 1892, photographic portraits could still be taken at Dawson's studio in Richmond Road and his tobacconist's shop at 106 London Road was still in business. In the 1891 Census return, William Dawson is described as a "mineral water maker, tobacconist and photographer". He is shown living at 7 Brunswick Row, Brighton with three young women - Kate Dennis, aged 23, Bessie Franks aged 21 and Ethel Christina Hand aged 17 (15)* - all three giving their occupation as "Photographer's Assistant". (*Ethel Christina Hand was born in Fenstanton, Huntingdonshire in 1876, but gives her age as 17). It may be significant that each time the census was taken in 1871, 1881 and 1891, William Dawson is never shown under the same roof as his wife. In the 1891 Census, Susan Dawson is recorded at 128 Richmond Road with three of her children - William Henry, Ada and Charles. William and Susan Dawson were finally divorced in 1894. It seems that William Dawson had begun a relationship with one of his employees, twenty-three year old Sarah Kate Dennis ( recorded as "Kate Dennis - Photographer's Assistant" in the 1891 census). 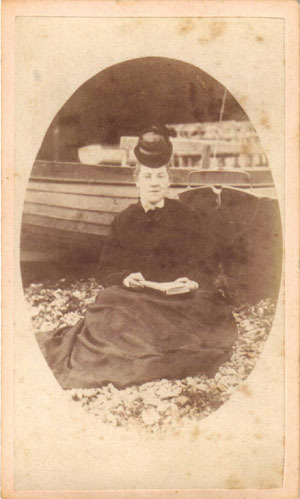 Sarah Kate Dennis had been born in Brighton in 1868, the second eldest daughter of Mary Ann Dean McFarland (born c1843, Brighton) and William Henry Dennis (born 1836, Penn, Buckinghamshire), a saddler by trade. Providing holidaymakers with food and drink became William Dawson's main occupation in the 1890s. In a directory of 1893, William Dawson is listed as the proprietor of a restaurant at 27 King's Road Arches .The King's Road Arches had been re-numbered by the end of 1893 and in Page's 1894 Directory, Dawson is shown with a restaurant at 65 & 66 King's Road Arches. Apparently, photographic portraits were still being taken in the photo rooms attached to Dawson's restaurant at 65 & 66 King's Road Arches throughout the 1890s, but it seems his main business interest was the provision of food and drink to Brighton's seaside visitors. At the time of the 1901 Census, William Dawson was living at Ditchling with his new family. After his marriage to Sarah Kate Dennis, Dawson moved to a new home "The Bungalow" in Lodge Road, Ditchling, 6 miles north of Brighton. Now aged 56, William Dawson gives his occupation as "Mineral Water Manufacturer (Employer)". With his young wife Sarah Kate Dennis, William Dawson had started a second family. Three children are recorded at their home in Lodge Road - George, aged 5, Doris, who was four years of age, and two year old Bertie ( Bertie Dennis Dawson had been born in Ditchling on 3rd August 1898 ). According to the 1901 census return, all three children were born in Ditchling, however it seems that the birth of George Dennis Dawson had been registered in the Sussex district of Cuckfield during the Third Quarter of 1895, as was the birth of Doris Dennis Dawson, early in 1897 . From 1905 to 1910, William Dawson is once again listed prominently as a seafront photographer in the King's Road Arches near the West Pier. In Kelly's Sussex Directories for this period, William Dawson is entered as a photographer at 69 The Beach, Brighton. By 1908, Dawson is still listed as a photographer working from Arch No. 69, but he is also shown as selling goods from a kiosk at the entrance to the West Pier. Dawson's refreshment rooms were still in place at Arches 67 and 68, alongside the photo rooms at 69 King's Road Arches. Kelly's Post Office Directory of 1911 records William Dawson as the proprietor of the refreshment rooms at 67 & 68 The Beach, at the foot of the West Pier steps, but does not list Dawson under "Photographers" in the Trades Section of the directory. In 1915, William Dawson is recorded as a Fruiterer near the West Pier as well as the proprietor of the refreshment rooms at Arches 67 and 68. William Dawson died at his home at 139 Ditchling Road, Preston, Brighton, on 19th July 1920, aged 77. William Dawson had succumbed to bowel cancer after a two year battle with the disease. Dawson's death certificate shows that he was working as a confectioner at the time of his death. A street directory of 1926 shows a Mrs S. K. Dawson providing food and refreshment at numbers 65, 66 and 68 Kings Road Arches, which indicates that William Dawson's seafront business passed to his widow after his death. 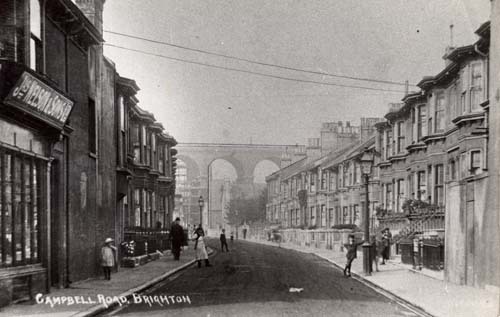 [ABOVE] A view looking down Campbell Road from New England Road towards the London Road Railway Viaduct which crosses Preston Road on its way to the Brighton Railway Terminus.(1904). For a number of years, William Dawson was based in Campbell Road, a small street leading off Brighton's New England Road. During the early 1870s, William Dawson worked from No. 1 Campbell Road, Brighton. 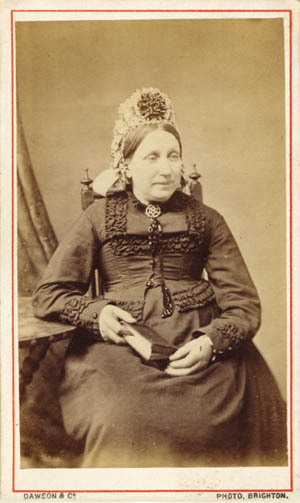 Carte-de-visite portraits produced by William Dawson between 1872 and 1874 carry a business address of 1 Campbell Road, New England Road, Brighton. At the time of the 1881 Census, William Dawson and his three sons were living at No. 15 Campbell Road, Brighton. 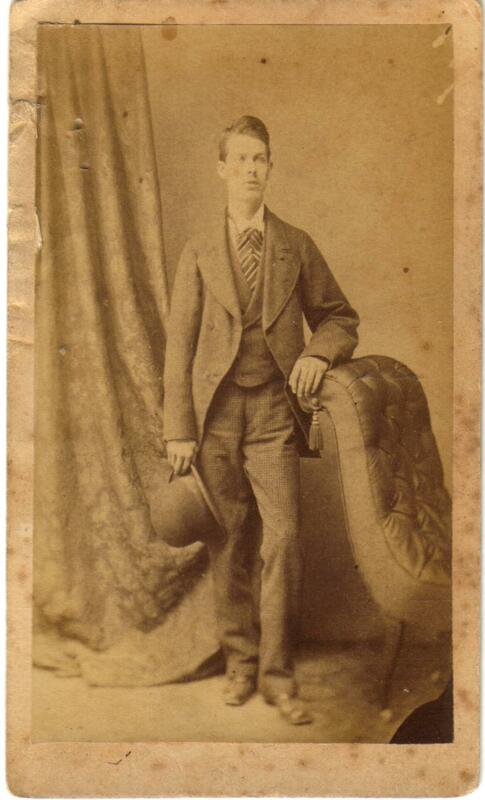 [ABOVE] A portrait of a young man, a carte-de-visite photograph by Dawson & Co. of 106 London Road (and at No. 6 Arch, West Pier), Brighton (c1874). Negative No. 723. 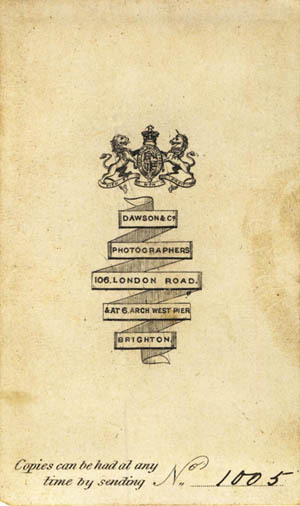 [ABOVE] The trade plate of Dawson & Co., Photographers, 106 London Road, Brighton, (and at No. 6 Arch, West Pier), from the reverse of a carte-de-visite portrait (c1874) [ABOVE] A portrait of a bearded man, a carte-de-visite photograph by William Dawson of 1 Campbell Road, New England Road (also at. 6 Arch, West Pier), Brighton (c1872). 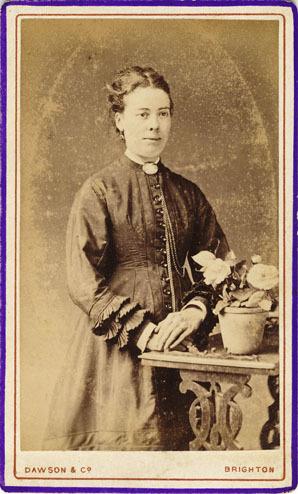 [ABOVE] A portrait of a woman standing by a plant stand, a carte-de-visite photograph by Dawson & Co. of 106 London Road, Brighton (c1878). Negative No. 2527. 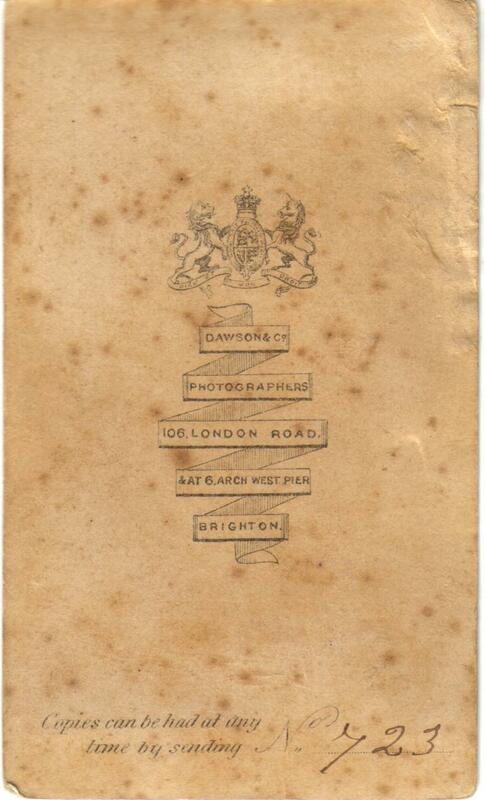 [ABOVE] The trade plate of Dawson & Co., Art Photographers, 106 London Road, Brighton, from the reverse of a carte-de-visite portrait (c1878). Negative No. 2527. [ABOVE] A portrait of a boy, a carte-de-visite photograph by Dawson & Co. of 106 London Road, Brighton (c1877). 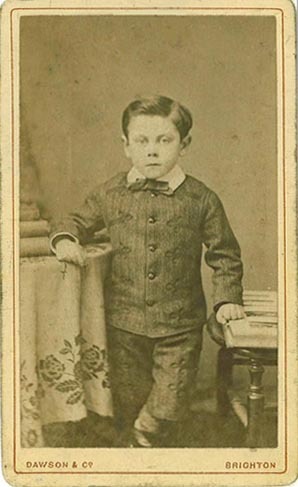 The boy is believed to be Arthur Dawson (born 1872, Brighton), one of the photographer's sons. 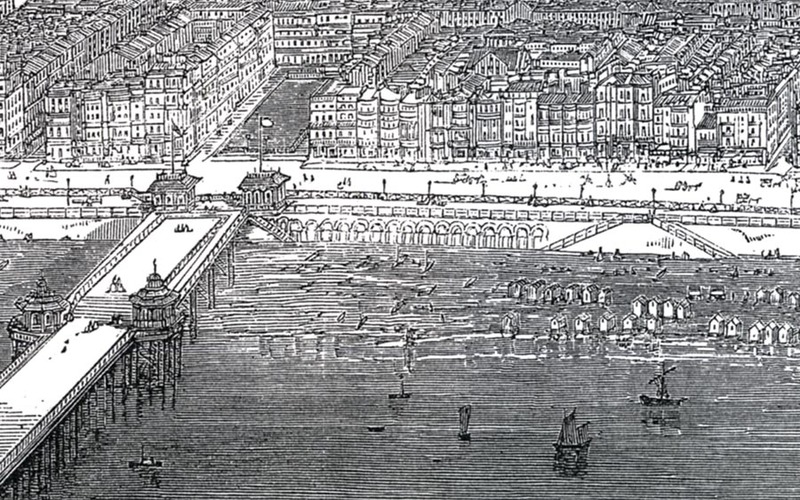 [ABOVE] Part of a panoramic view of Brighton's seafront, published in the Illustrated London News in August 1872. This section of the woodcut shows the West Pier, on the left, and the King's Road Arches running up to the triangular structure which was later used as the Brighton Lifeboat Station. It was from this area of the seafront, close to the West Pier, that William Dawson worked as a photographer for forty years. 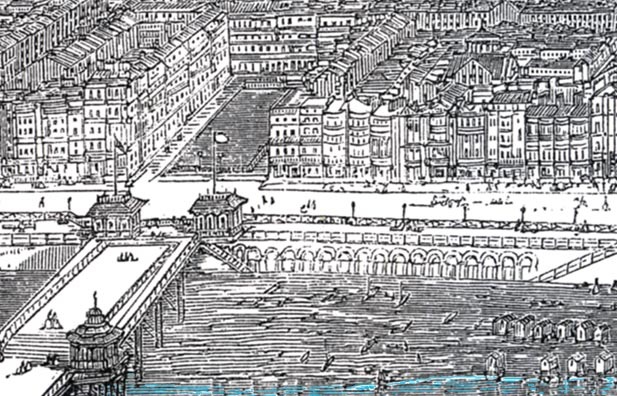 [ABOVE] Detail of the 1872 woodcut illustration of Brighton's seafront (see previous picture), showing the West Pier steps (centre left) leading down to the King's Road Arches and the Beach, where William Dawson operated as a photographer from about 1872 to about 1912. Boats and bathing machines can be seen on the beach close to the water's edge (shaded blue). [ABOVE] A recent photograph of the area at the foot of the West Pier Steps on the Lower Esplanade, where William Dawson operated as a photographer from around 1878 to 1912. By 1890, Dawson had established a "refreshment room" on this spot. Kelly's 1890 Directory of Brighton lists William Dawson as "refreshment room & photographer" at a location between the "West Pier steps" and the Sailing Club and Lifeboat Station near the "Metropole gap" (The Hotel Metropole on Brighton's King's Road opened in 1890). The same "square arch" at the foot of the West Pier Steps is still used as a refreshment bar, as can be seen in this photograph taken in 2004. 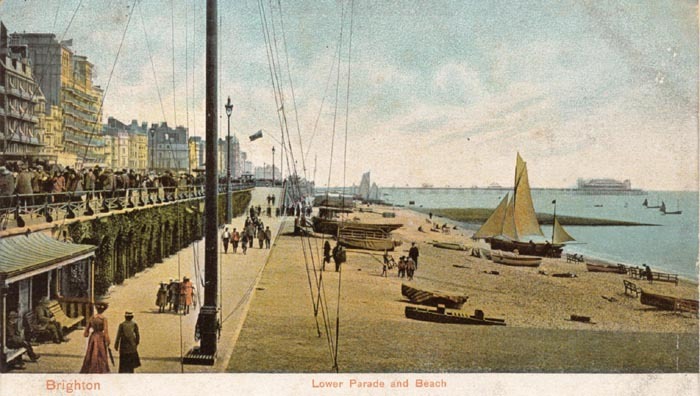 [ABOVE] An Edwardian picture postcard entitled "Lower Parade and Beach" showing the area of Brighton's seafront where William Dawson made photographic portraits of holidaymakers between 1872 and 1912. Dawson's darkroom was situated in one of the arches on the Lower Esplanade which supported the Upper Esplanade on the King's Road. The east wing of the Metropole Hotel and the imposing Grand Hotel can be seen in the top left of this picture. William Dawson operated as a photographer on Brighton's seafront from around 1872 to about 1912. The address of his studio was given variously as "The Beach", "Kings Road Arches" and the "Lower Esplanade". The Lower Esplanade ran beneath the Kings Road, from the West Pier to the Fish Market, below East Street. 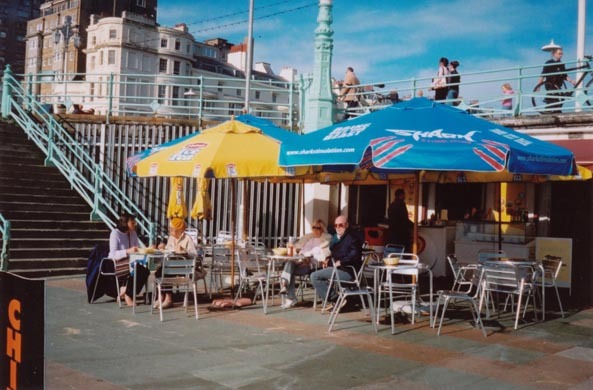 According to Timothy Carder, author of 'The Encyclopaedia of Brighton', for many years the Lower Esplanade was "a ramshackle area frequented by stall-holders and street entertainers." The Lower Esplanade followed the shore line and the businesses that operated here in the 1870s such as boat builders, refreshment rooms and pleasure boat owners, often gave their address simply as "The Beach." The King's Road was supported by a row of arches under the main road. The spaces in these arches were originally used by fishermen to store their nets, but from the early 1870s the King's Road Arches were used by seafront businesses, such as boat builders. William Tickner was a boat builder who made use of the large tunnel-like arches near the steps that led up to the Grand Hotel. Other arches on the seafront were used as small offices, refreshment rooms, and places of entertainment. 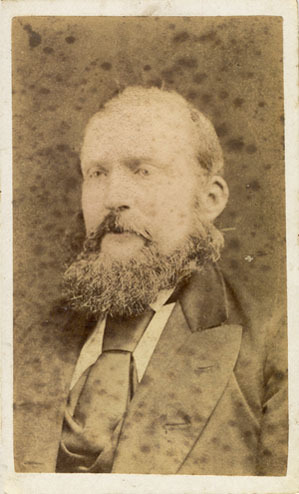 William Dawson established a photographic studio at No. 6 Arch, near the West Pier entrance, around 1872. Dawson was to be the first of many "beach photographers" to establish a studio or darkroom in the King's Road Arches. 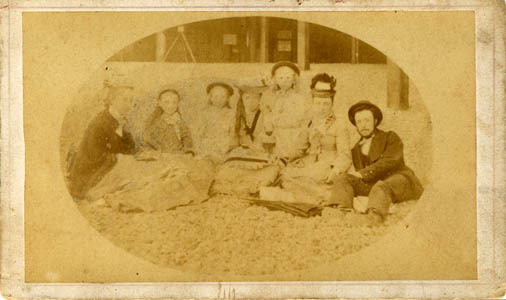 In 1874, William Dawson appears to have been the only photographer to give his studio address as "The Beach". Dawson's early beach photographs, which were produced in the carte-de-visite format in the early 1870s, carry an address of 6 Arch, West Pier, Brighton. By 1878, Dawson had been joined at 'The Beach' by another photographer, Thomas Frederick Foulkes. Dawson's studio was close to the West Pier, while Foulkes was located some distance away, near the Middle Street gap. In the 1880s, the Kings Road was widened and was bolstered by another row of arches under the main road between West street and East street. By 1890, the Kings Road Arches housed a number of businesses and places of refreshment and amusement, including a rifle shooting gallery and a bowling alley. William Dawson's first seafront studio was located at No 6 Arch in the King's Road Arches near the West Pier. By 1878, Dawson appears to have moved to a better placed position at the foot of the West Pier Steps. Numbering of the Kings Road Arches was erratic in the 1870s and 1880s, but initially ran from east to west. Because of it's prime position next to the West Pier Steps, Dawson's studio was rarely identified with an arch number in local directories during the 1870s and 1880s. 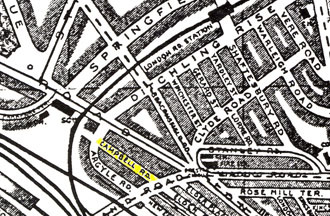 Between 1878 and 1887, Kelly's Directory gives the address of Dawson's studio as simply "The Beach, King's Road". A directory of Brighton & Hove published in 1893, lists William Dawson as the proprietor of a restaurant at 27 King's Road Arches. Around 1890, the Kings Road Arches had been re-numbered. The businesses under the Kings Road were now numbered from left to right, starting from, rather than ending at William Dawson's premises near the West Pier. To confuse matters even further, the numbers on the Arches were changed again four years later. Page's 1894 Directory of Brighton & Hove lists William Dawson's seaside restaurant at 65 & 66 King's Road Arches. The re-numbering of the King's Road Arches that had taken place around 1893 had effectively increased the numbers of each business address by a difference of around forty or more. Looking at trade directories which span the late 1880s to the early 1900s, the impression is given that William Dawson (like the other photographers based in the Kings Road Arches) was continually changing the site of his seafront studio, when in fact he was occupying roughly the same spot over a period of 34 years. The location of the Kings Road Arches studios remained relatively constant; it was the numbering of the Arches that was frequently changing. 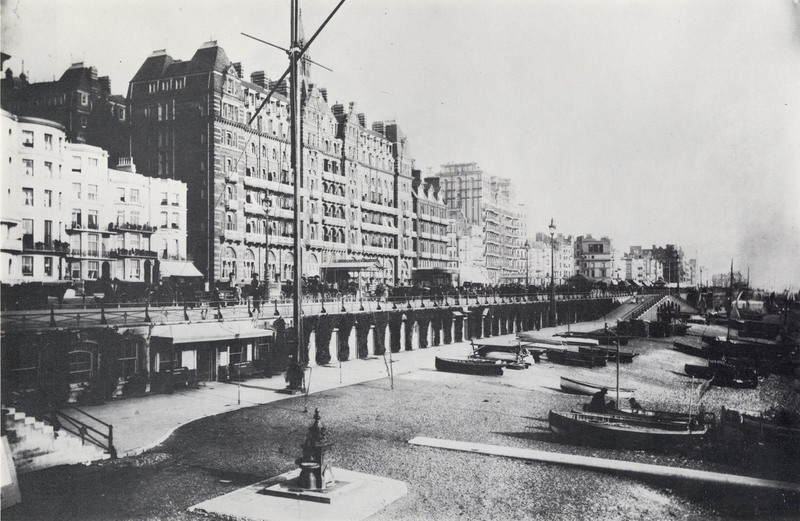 [RIGHT] A photograph of the Lower Esplanade between the West Pier steps and the Hotel Metropole Gap (c1900). Along the side of the Lower Esplanade are the row of arches that supported the widened King's Road above. When this photograph was taken, the King's Road Arches on this particular stretch of the Lower Esplanade were numbered 65 to 112. The Brighton Street List in the 1901 edition of Towner's Brighton & Suburban Directory records William Dawson's Restaurant at No.68 King's Road Arches and Kelly's 1899 Directory of Sussex locates Dawson's refreshment room next to the West Pier steps. 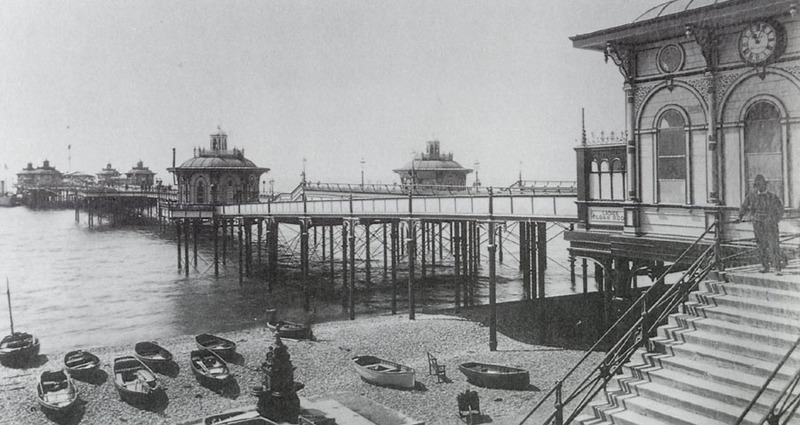 The steps that led up to the West Pier entrance on the King's Road can be seen at the bottom left of this photograph. Presumably, the buildings on the lower esplanade between the West Pier Steps and the tall mast are the business premises of William Dawson. From 1894 to 1912, Dawson used the rooms numbered between 65 and 69 in the King's Road Arches. 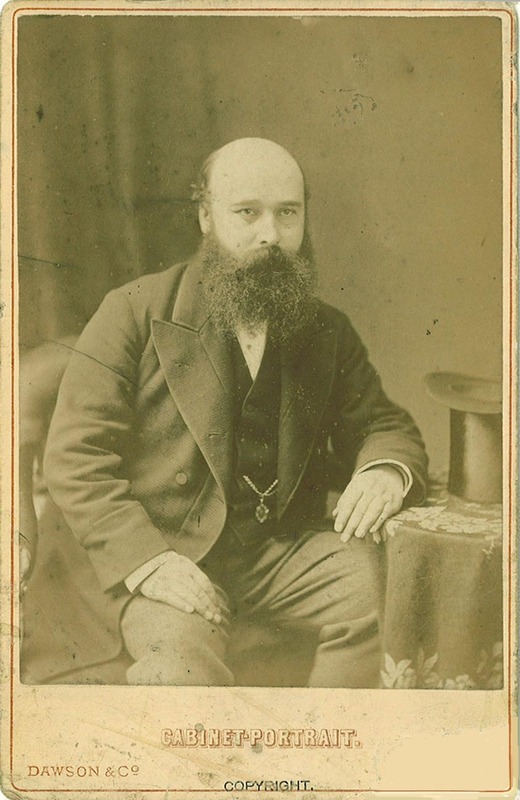 William Dawson was regularly listed as a photographer in the King's Road Arches after he closed his photographic portrait studio at 128 Richmond Road around 1893. The location of William Dawson's Photo Rooms is generally given as 65 King's Road Arches and the address of Dawson's restaurant and refreshment rooms is usually listed at 66, 67 or 68 King's Road Arches. The trade listings in Kelly's 1890 Directory seems to suggest that previously Dawson took portraits in the same building as his restaurant [ i.e. " Beach (The), from west to east ... here are West Pier steps ... Dawson Wm. refreshment room & photographer ]. In this photograph, probably taken "out of season", the Lower Esplanade is almost deserted, yet above the Arches, the King's Road is bustling with people and horse-drawn vehicles. The impressive building that can be seen behind the large mast is the red brick and terracotta Metropole Hotel, which opened in 1890. To the right of the massive Hotel Metropole is the Grand Hotel, which had been completed in 1864. The triangular structure, which supports the ramps leading up to the King's Road, housed the Brighton Corinthian Sailing Club (108 King's Road Arches), the Lifeboat Station (109), the headquarters of the Royal National Life-Boat Institution (110) and the Town Life Boat Station (111 King's Road Arches). [ABOVE] The Lower Esplanade and the King's Road Arches between the West Pier steps and the Hotel Metropole Gap (c1900). [ABOVE] Detail from the advertisement for William Dawson's West Pier Kiosk illustrated on the right. 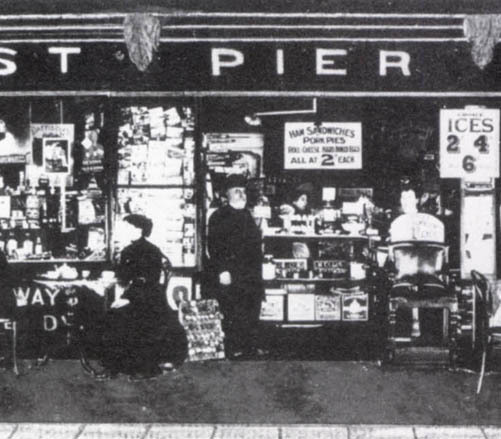 The stocky, bearded figure in the centre of the picture resembles William Dawson, the proprietor of the West Pier Kiosk. 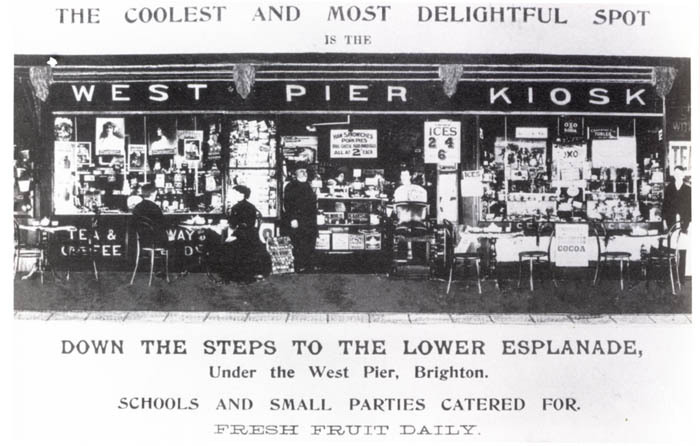 [ABOVE] An advertisement for William Dawson's West Pier Kiosk which appeared in a local directory around 1915. At this time William Dawson was also earning his living as a fruiterer. Dawson's refreshment rooms at 67 and 68 King's Road Arches sold tea & coffee and snack food such as ham sandwiches and pork pies. [ABOVE] Two of William Dawson's children photographed at their father's photographic studio in Brighton. William Henry Dawson (born 1874, Brighton) is pictured on the left. The boy on the right is probably Arthur Dawson (born 1872, Brighton). Thanks to Jonathan Newman for providing details about William Dawson's family history. William Dawson is Jon's great, great grandfather. Jon Newman's great grandmother was Susan Helen Dawson (born 1876, Brighton), the seventh child of William Dawson and Susan Elmer Hunter.